WASHINGTON-When the president and first lady sit down to dine at the Japan State Dinner tonight, they will be eating off new White House dinnerware designed by Pickard China. The Obama State China Service is a simple banded pattern whose blue-green rim color, Kailua, was inspired by the waters of Hawaii, President Barack Obama’s native state. The gold-edged, Kailua rimmed pieces are featured on all of the pieces of the 11-piece set except for the dinner plates, which are white and rimmed in gold with the presidential seal in the center. 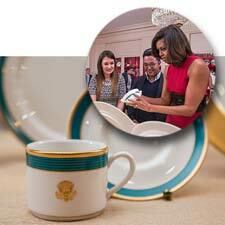 Two of the 11 items in the Obama White House china service, the dinner plate and individual soup tureen, were unique relief shapes that had to be designed from scratch, Morgan said, and it took Pickard more than a year and countless trial pieces to get the individual tureen bowl completed.